Nikolai was a 5 star guide!!!! He was so knowledgeable and made our time in St Petersburg so interesting!!!!! I would definitely recommend him to our friends! Extremely knowledgeable about St. Petersburg. I feel we saw the highlights and had a great understanding of the history of the city. Having traveled to St Petersburg previously we had already toured all of the highlights. This tour was perfect for our return visit to St Petersburg. Nikolai was a great guide. I had A LOT of guides to choose from in St. Petersburg but after looking trough my options I decided on Nikolai.. all I can say is WOW!.. what an excellent choice! I was a little nervous about traveling around Russia, our ship issued a caution warning to the American guests but all my fears were for nothing. I could not have felt more safe and was not at all worried. Nikolai is extremely knowledgeable and gives just the right amount of information. I HIGHLY recommend him, you won't be disappointed! Nikolai was waiting for our family group of four when we disembarked the Regal Princess in St. Petersburg. He was extremely knowledgeable about the history of this remarkable former capital of Russia. He kept us informed concerning all that we passed along the way to Peterhof, and was an excellent guide there and at The Hermitage later in the afternoon. He was particularly attentive to my sister-in-law's needs to walk slowly and to sit when there was availability. An overall fabulous tour experience. Nikolai is a wonderful guide that knows so much about the city and all the attractions we visited. He is very flexible with itinerary arrangements as well and really cater to our needs. We had a lovely time in Saint Petersburg and surely learned so much about it! Highly recommend! Nikolai was a fantastic guide for our trip to St. Petersburg. We were in town for the World Cup and he showed us the many wonders of the city. Nikolai pointed out things that we would never have looked at on our own and was able to get us past all the long lines. He was very patient with us and very knowledgeable. We highly recommend getting in touch with Nikolai as your tour guide for the city. We had Nikolai as a guide last year and, returning this year with a friend, engaged him again, this time for a tour to Russia's WW1 museum (which is terrific, but requires the help of someone fluent in both Russian and English) and the Catherine Palace. Not only is Nikolai extraordinarily knowledgeable, he is also incredibly flexible and responsive to his guests' needs; he adjusted the timing and order of his standard tour to our preferences, and made sure we caught the train at the end of the tour. TOUR GUIDE RESPONSE: I am glad that Lance, Chuck and Renee enjoyed the tour to town Pushkin where we have visited unique WW1 museum in Martial Chamber (founded more than a hundred years ago). Visiting the Catherine Palace completed our visit Tsarskoe Selo and we arrived to the Finland train station in time. I am always happy to give detailed information about sights we visit if this is of interest to my guests. Nikolai's vast knowledge on the city of St. Petersburg and the Catharine Palace made the tour a completely immersive experience. Despite the wet weather on the day of the tour, we continued our visit around the grounds outside the palace. I am glad we persisted as the countryside was absolutely stunning with all the autumn colours in the billowing wind! TOUR GUIDE RESPONSE: Autumn is one of my favorite seasons. Parks are very beautiful this time of year and not so crowded. Show these places to my customers with great pleasure. Nikolai is an extremely knowledgeable guide. He knows the city like the back of his hand, and was able to provide insightful commentaries on the sights we passed during our 50-minute drive to Peterhof. His expertise in the history of the Grand Palace itself is absolutely impressive. Highly recommended! So knowledgeable and completely professional. Highly and totally recommendable! Nikolai is a great passionate guide who made sure we understood and loved his culture. Visiting the palaces with him made a great difference, he is very good! We enjoyed our two-days in St. Petersburg with Nikolai. His insights and English are superb. We greatly appreciate that he pre-purchased all the tickets and visa that we needed. Saved us a lot of paperwork and long lines. He led us to the best entrances and really helped us navigate the major sites of St. Petersburg on a busy summer weekend. From the Hermitage to the Peterhof Palace, Nikolai shares the stories and history behind each piece of art and each czar. Highly recommended. Highly recommend this tour since you get to see the real life in St Petersburg. The best part was the Russian bath which was truly authentic. Wonderful tour experience! I've taken tours all over the world and left disappointed. Nikolai was very polite and helpful, but given the high cost for a private tour, we were disappointed. Communication was very difficult. We don't feel like we really gained a local's insight. He's a good guy, but couldn't answer so many questions for us. This is a very expensive option to not receive high quality insight and clear communication. I cannot recommend tours by locals based on this experience. Our tour of the Hermitage Museum and the best of St. Petersburg truly enriched our visit to this lovely city. Nikolai helped us navigate the huge collection of art at the Hermitage Museum in a way that made the experience more enjoyable especially since we were visiting the museum with our teenage children. Nikolai also toured us around the city with a van and gave us so much insight into the history behind each of the amazing sites. Nikolai spoke perfect English. We highly recommend Nikolai. Nikolai was very informed about history for all the tours he took me on which were to Peterhof, Pavlosk, Tsarkoe Selo, Oranienbaum and Gatchina. He was very helpful and has a good attitude. Nikolai is very knowledgeable of the city and was extremely helpful in ensuring we were able to see everything we wanted to see and more. Great tour guide! Nikolai is as knowledgeable and personable a guide to St. Petersburg as one could ask for. He is also very patient and flexible, as we had to change our requested itinerary more than once due to some mobility issues, and he was always ready to accommodate us. Ultimately he gave us exactly the overview of the city that we needed. We went back to one quirky place he showed us and loved it, and he also helped us get tickets to a show. We recommend him without hesitation. Nikolai is an excellent guide. He is very courteous and knowledgeable.He catered the tour to our request. We communicated via email and he helped us arrange a schedule that would fit our wants and needs. He purchased the tickets ahead of time to assure us the ability to see the places we wanted to see. He is very courteous & knowledgeable . We highly recommend Nikolai. Nikolai was just great. He was super-flexible on matters outside *our* control. He did all we asked, and more. His information was helpful and useful. I only wish we'd found him on the first day of our trip so we could have looked at more places with him. Strongly recommend! Nikolai did a great job of getting us to and around the sites that we were not able to see with the large tour group we had been with. It was a great day and a grand way to finish our time in St. Petersburg. I am handicapped and was worried about visiting Russia but Nikolai made it the most wonderful experience in my life. His professionalism was impeccable. His knowledge was extensive. He was able to obtain a wheelchair when I couldn't use my walker. We never had to stand in line. He also knew the best place to eat. Thank you Nikolai for making our trip so memorable. Nikolai was fantastic in his varied description of the details of Catherine's palace and grounds. He was very welcoming and friendly. I highly recommend him as a guide! He understood and spoke English very well. This was a great tour. Nikolai is both well-organized and knowledgeable about his city. with intelligence and charm, he took us on a interesting adventure that allowed us to have greater insight into this marvellous city. I would gladly participate in any of his other tours. AMAZING! Such a great tour! Nikolai was on-time picking us up directly from our hotel. He told us about tons of places on the hour or so drive to Peterhof. His English was extremely good, so he was able to speak quickly without having to think too much about how to say something. I eavesdropped a bit on some other English tour guides and Nikolai was way better. We had a great walk through the palace itself. He timed the excursion perfectly -- we saw the opening ceremony just as we exited the palace. We had two days planned in St. Petersburg and Nikolai was going to be sure that we visited all the highlights. 15 hrs on Sat. and 8 hrs on Sun. We called the day before to see if he could arrange Ballet tickets for us. We had the best seats in the house for Swan Lake at the Palace Theater. The experience was unbelievable! Nikolai was very well informed with all the locations we visited and thankfully was able to negotiate a shortened queue to the city's highlights very efficiently. Highly Recommended! Nikolai listened to the staff and worked with our timings and definitely showed the highlights of the Hermitage museum. Thank you! Nikolai was a fantastic guide. We enjoyed every minute of the tour! TOUR GUIDE RESPONSE: I also enjoyed! Thank you Kathy DeFonso! Very pleased that I spent the afternoon touring with Nikolai. He truly enhanced my visit to Saint Petersburg, and the half-day we spent together made me more comfortable in wandering about on my own. Unexpectedly,the produce market was a highlight - I need to return! Nikolai was a pleasant and informative guide who made the experience both interesting and easy for us. He picked us up right at the door of our apartment building and had arranged tickets so we didn't need to wait in a long line. He expertly guided us through the palace. We don't like to zip through, but really like to get a good look at things, take pictures and go at our own pace; he helped keep us clear of the enormous tour groups and helped us see the palace on our terms. Excellent experience. Excellent guide who was very knowledgeable about the places we visited and made the visit completely seamless. Nikolai was excellent! Very knowledgeable and professional. He was very congenial and accommodating, making stops when needed, allowing shopping detours as requested, etc. He was fun to be with, and I would use him again should I ever return to St Petersburg! Overall great guy!! Nikolai was a very well informed and personable guide. He had a deep reserve of knowledge about the Catherine Palace, the Romanovs, and Russian history. He was able to answer all our varied questions and was pleasant company on the 4:30/5 hour tour. We recommend him without hesitation. Nikolai is an excellent guide. We rode in his exceptionally clean car to Catherine Palace. On the way he kept a running commentary of historical events relating to the Czars and architects of Catherine Palace and the surrounding areas. We also went to the St. Isaac's Cathedral after our tour of Catherine Palace. Nikolai is extremely knowledgeable, patient and flexible. We will recommend him to all of our friends. Nikolai is an excellent guide. He took us on a three hour tour of the Hermitage and gave excellent background on both the building and the treasures. He was able to be flexible and accommodating he was happy to bypass those exhibits we were less interested in yet very knowledgeable when we expressed a special interest in particular items. I had the impression that he knew the history and significance of every item in the entire collection. I highly recommend him. Excellent tour. By the time that we went to Peterhof in the afternoon my husband was very tired. On the ride over in the hydrofoil Nikolai told us about the history and architecture of the gardens. When we arrived we went to those areas of the grounds that were of particular interest to us or to Nikolai and he described in detail those areas that we were too footsore to visit. Although we were not able to cover extensive areas, we felt that we had a thorough tour of the grounds and fountains. Very pleasant and reliable guide who was very well versed in both art and Russian history. I would highly recommend him. He arrived at our hotel as scheduled and took us to Catherine's Palace for a great tour. He had already reserved our tickets so we were inside the gates quickly. He took us through the palace as well as the gardens and then we had lunch at a little restaurant about 5 minutes drive from the palace. We had a great time and highly recommend him. Nikolai is a marvelous, knowledgeable, personable guide who is a pleasure to be with. He created a comprehensive, full-day introduction to the highlights of St. Petersburg, including 2.5 hours at the Hermitage and an evening canal boat ride. Everyone on the tour was entirely pleased with the structure and comprehensive nature of the tour. Highly recommended. TOUR GUIDE RESPONSE: Thank you very much for a good reference! I am glad you enjoyed your visit St. Petersburg! TOUR GUIDE RESPONSE: Visiting non touristic places of St. Petersburg is something special for those who want to see a little bit of life of locals. It was my pleasure to introduce you this side of St. Petersburg! Nikolai is very knowledgeable and shared a wealth of information re: the palace and the czarina with us. He is also very personable, speaks fluent English, and professional. A great guide! Nikolai M proved to be a very knowledgable guide whose English was excellent and understanding of the Russian history quite amazing. Nikolai collected my wife and I promptly and drove us to the Alexander and Catherine palaces. He imparted great knowledge about his subject matter and was polite and friendly throughout the tour. Most memorable. TOUR GUIDE RESPONSE: I'm happy Mr. Grant Rogerson had enjoyed visit 2 palaces in Tsarskoe Selo. Thank you for the good reference! Very awsome tourguide very knowledgeable and very good english. If you are looking for a great guide to St. Pete: He is the right one! TOUR GUIDE RESPONSE: Hello Kiki and Vika! I am glad you enjoyed the tour! I hope you also had success in exhibition. Kind regards from St. Petersburg! Nikolai. Nikolai provides very good service as a guide and as a driver. My flight from Moscow was delayed, I called to Nikolai and informed him about it. He came to the airport intime, he helped me to bring all my luggage to the car. took me to the hotel and showed around the city. Excellent service! I highly recommend Nikolai to all travellers visiting St. Petersburg! TOUR GUIDE RESPONSE: I am pleased to receive this reference! Thank you for booking my tours and for using my service! What a fabulous time. Nikolai was a true gentlemen to my mother in law and was able to answer many questions regarding the time period we were iterested in as well as Russia in general. Punctual, accommodating and having done 3 Tours By Locals before this one tour was By far the BEST. Highly recommended. We intend to return to visit some museums and have already told him we are coming back. We will only use and recommend to our friends Nikolai. This is my first experience with ToursByLocals... I'm very pleased to work with you. Since the beginning, all the process were very smooth..The tour proposal was excellent. Regarding Nikolai, he did a very good Job ..the tour went perfect and just as it was planned. Thank you very much for make this trip an excellent and memorable trip. Great day visiting markets, a banya, metro stops, churches and a synagogue. N was a super guide. Excellent guide. He really knows his stuff, has a grey understandable command of his english and drives his own car. The day in Peterhof was amazing and he just made it that much better. He was the best anyone could ask for. Highly recommend him. TOUR GUIDE RESPONSE: Thank you for the nice reference! I always try to do my best! TOUR GUIDE RESPONSE: I am happy that you liked my tour to the Catherine palace and park. The park is quite big and there are many out-of-the-way beautiful places, which I show to my guests with pleasure. TOUR GUIDE RESPONSE: Duayne! I am glad you enjoyed esperience of traditional public Russian bath. I myself love the bath and with pleasure take my guests to some of them! Thanks. Niko. I would like to thank Nico for really accommodating me on some last minute changes on the tour. A very kind and knowledgeable guide. More Power ! TOUR GUIDE RESPONSE: John! Thank you for rating my service very high! 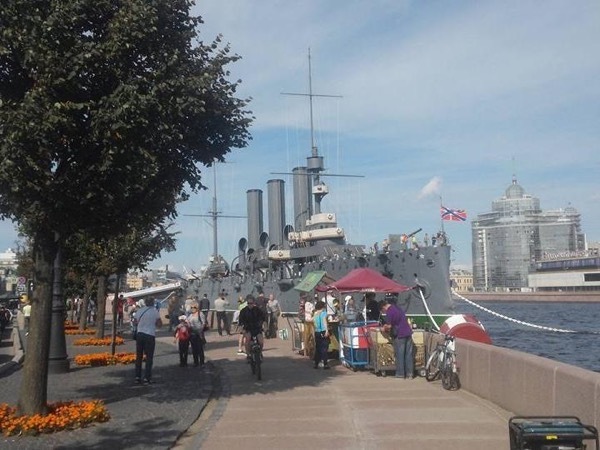 come back to St. Petersburg in the summer time and I will show you around the city in ¨White nights"